The Ocean Course at Cabo del Sol is another Jack Nicklaus signature golf course, this one with 1.5 miles of oceanfront along the Sea of Cortez. Considered by some to be the most challenging in Cabo San Lucas and Los Cabos. Golfers will surely like Cabo del Sol Ocean Course. 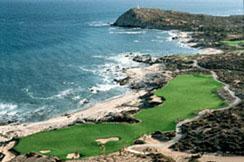 Cabo del Sol Ocean Course is very famous golf course of san cabo lucas and cabo area. Find the exclusive facts, figures and information here. "cabo golf website" Also provide Villas and accommodations information for Cabo Golf Vacations, find the suitable vacation homes suggested below and enjoy your golf vacation in Cabo San Lucas. Telephone - (624) 145-6300 / (624) 145-8200 / Fax: (624) 145-8202. From USA (011 52) first. Statistics - Yards: 7,075 - Slope: 147 - Par: 72 -Rating: 74.5 / Front 9: 3,608 - Par 36; Back 9: 3,467 - Par 36. Elegant modern home with the feel of an old Mexican Hacienda. Located right on the beach and the dramatic seaside 17th green of Cabo del Sol's Ocean Course. Accommodates up to 16 people or up to six couples, all in private quarters. Located right by the world-class Cabo del Sol course, Casa Las Brisas is a golfer's paradise. The prestigious community of Cabo del Sol offers security, privacy, and all the amenities of a luxury development. Inside and out, Casa Las Brisas reflects the elegance of a traditional estate hacienda. With stunning artwork and bold dcor elements, every room in this house has presence. Pieces chosen reflect a discerning and sophisticated taste. Every colour, texture and accent has been carefully considered in creating an expression that is both beautiful and sublime. This exquisitely appointed Mexican style luxury condo has all of the extras. A sapphire faceted entry lead to a beautiful open floor plan that invites ward ocean breezes for an unforgettable stay. Professionally designed interiors include wonderfully unique artwork and accessories, Terracotta tile floors, hand-painted Mexican tile and quality furniture throughout. A home of impeccable taste and quality, Villa Pelicano is situated in the prestigious and exclusive area of Puerta del Sol where only the best and most beautiful are the norm. True to its locale, this home features finely chosen quality dcor with a richness of texture and tone.